In one of our previous articles, we discussed what we loved about the Sea Eagle 420x Explorer – and perhaps some of the cons that fellow paddlers may not love as much, depending on their adventure. In the spirit of our Weekly Ho-Ho-Holideals Sale, this week you can get $50 off any of the beloved Sea Eagle Explorers! So which one is best for your adventure? This solo inflatable kayak packs a punch. Whether you’re looking for a stable kayak you can soak up your surroundings in, or if you’re a thrill-seeking daredevil who loves to hit rapids – this kayak can do it all. Our family takes this inflatable out whenever we hit the water as a family. 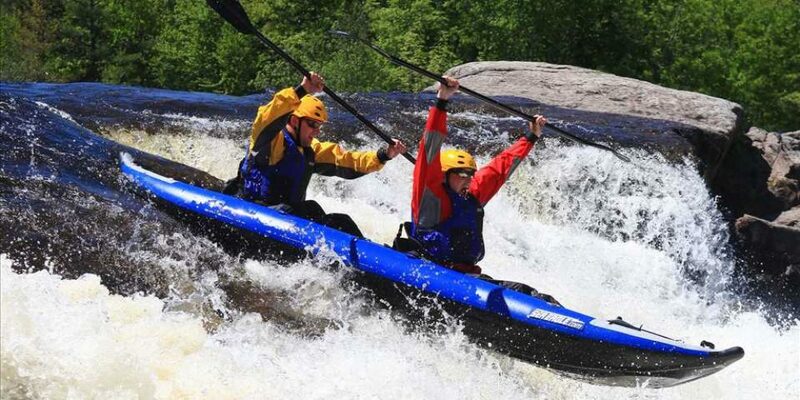 It’s super stable, and is truly a great kayak. Beware – this is a beast! We are able to fit our Dad, our two kids, Grandpa, and our 90-lb Bernese Mountain Dog, Bella in it. Don’t believe us? See for yourself!